Does Age Affect The Way We Eat? Ageing has a profound effect on the way we eat, and because this has only recently been recognised, a lot of research is currently being conducted into the relationship of ageing, health and food. In addition, as people live for longer, there is a strong emphasis on trying to find ways to improve health and enjoyment of life in older age. Certain diseases and conditions, such as senile dementia and Alzheimer’s Disease, also appear to be affected by nutrition. There are two basic food pyramids for people over sixty, and they are quite different in approach. A major component of the dietary understanding of food and older people has been the outcome of the Okinawa Project – a 25 year study of a group of Japanese people who are healthy and active into extreme old age. The Okinawa Project developed a food pyramid that is based on eating habits discovered in the longest-living healthy people in the world. It’s nutrient rich but low calorie. If you want to live to 110 (a fairly common age in these Japanese islanders) you’d have to consume 20% fewer calories than the Japanese average – that’s over 50% less calories than the average Westerner. It also means eating three times more green and yellow vegetables than the standard food pyramid recommends, up to twelve portions a day! Fish makes up less than a serving a day, soy products need to be two or three servings a day and almost no meat, eggs or dairy products should be eaten. The Okinawa Pyramid is a complicated system that relies on calorific density – so for examples featherweight foods like apples, berries, peaches, broccoli, pumpkins and so on have a density of less than one, while heavyweight foods have high densities: cheddar cheese has a density of 4, bacon is 5 and peanut butter is 5.9! 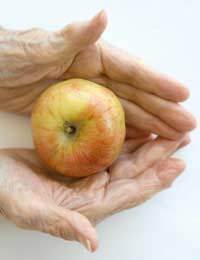 Essentially the older person can consume as much featherweight food as they wish but keep heavyweight foods for one portion a day. Obviously such a drastic diet should only be undertaken with medical supervision. Tufts University in the USA has a specialised unit that studies older adults. Their modified food pyramid was released in 2008 and suggests some dietary changes that may surprise people used to the traditional approach to feeding senior citizens. The first surprise is that there is a flag perched above the pyramid which denotes the discovery that many older people are deficient in calcium, vitamin D and vitamin B12 – older people need more of these nutrients than standard adults and it can be difficult to achieve enough of them in a diet where the portion size is decreasing, as is often the case in older people who either enjoy food less or are limiting their calorie intake so as not to gain weight. The Tufts team suggests supplements are the answer. The second surprise is that many older people are dehydrated, which can lead to symptoms of confusion and irritability which are often misunderstood as early symptoms of dementia. Adequate hydration can improve concentration and the researchers point out that water rich foods such as lettuce, cucumber, grapes vegetable juices and soups can all be used to increase the hydration in the diet. Finally, the Tufts Modified Pyramid recommends different kinds of food that older people, especially those living alone, may find it useful to consider when planning their daily food intake: re-sealable bags of frozen vegetables and single-serve portions of fresh fruit in juice are ideal ways for senior citizens to achieve optimum dietary intake without having larger amounts of fresh fruit and vegetables and go through time-consuming preparation that can actually reduce the desire to eat the food once it is ready.